If you’re looking for a brunch dish that doubles as a light dinner, this skillet salmon potato hash recipe is it! Thank you to the Little Potato Company for helping me share this recipe with you. When we lived in Manhattan many years ago, there was a killer breakfast spot just a couple of blocks away from our apartment. In truth, it was a diner serving up burgers, sandwiches, salads and eggs every style, every hour of the day. As good as their Cobb salad was, I was a sucker for their omelets with a side of hash. Tender, salty and perfectly browned on the flat-top grill. Extra hot sauce and ketchup, please! Since we don’t go out for breakfast very often any more, a perfected homemade hash is essential. As much as I love serving them with any of my favorite egg recipes, I now have a penchant for dinner hashes with some sort of protein mixed in, like this ham version or my new favorite salmon potato hash. The trick to a good hash is two-fold. First, boil the diced potatoes until just tender before browning them in the pan. 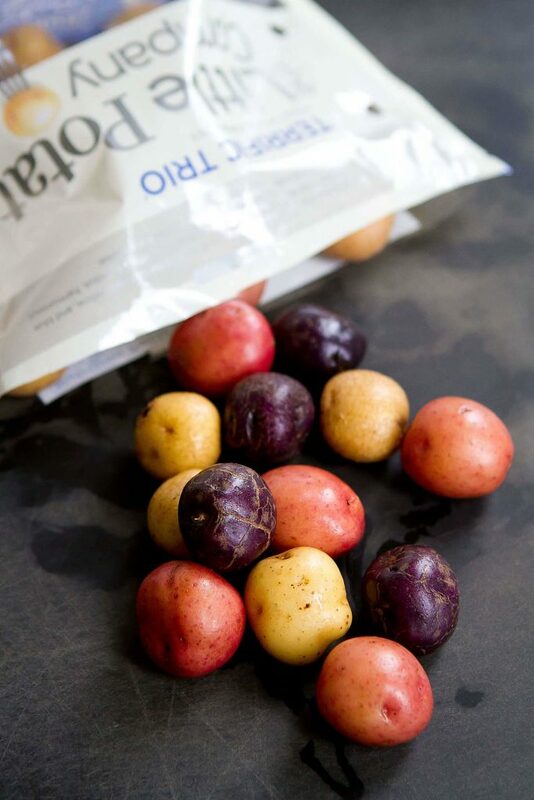 My favorite Creamer potatoes from the Little Potato Company are awesome in this recipe. I used the Terrific Trio, but any of their Creamer varietals would work. The second trick? A HOT skillet, preferably cast-iron for stellar browning power. If you don’t have a cast-iron pan, that’s okay. Just make sure that the skillet is good and hot when you add the potatoes. As much as I love the flavor and texture of the Creamer potatoes, the nutritional value is a huge selling point for me. For example, they are a great source of potassium, which helps the body absorb calcium and can be one way to build up your bone strength and avoid osteoporosis. There are days when I struggle to get the recommended daily allotment of potassium. Instead of throwing an extra banana into the mix, I cook up a pot of Vegan Potato & Kale Soup, a batch of Instant Pot Chicken & Potato Curry or some of this salmon potato hash. Problem solved! Bring a large saucepan of lightly salted water to a boil over high heat. Add the diced potatoes and cook until just tender, 6 to 8 minutes. Drain. Season the salmon with ⅛ teaspoon salt and ⅛ teaspoon ground pepper. Heat 1 teaspoon canola oil in a large skillet (preferably cast-iron) set over medium-high heat. Add the salmon (skin side down if it has skin) and cook until the fish is opaque about ¾ of the way up the fish, about 5 minutes. Flip the fish and cook for 2 minutes. Transfer to a plate. When cool enough to handle, break up into pieces. Add ½ teaspoon oil to the skillet, and add the onion and pepper. Cook until tender, 4 to 5 minutes. Add the garlic and cook for 1 minute. Add the remaining 1 teaspoon oil and stir in the potatoes. Cook, stirring occasionally, until the potatoes start to brown, 8 to 10 minutes. Stir in the salmon, spinach, dill, ½ teaspoon salt and ½ teaspoon ground pepper, until the spinach is just wilted. Serve. This looks packed with flavor! 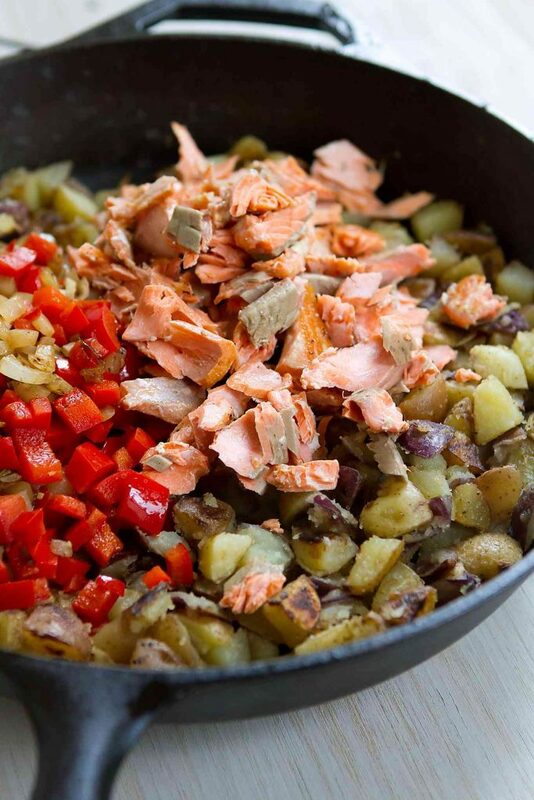 The salmon and the potatoes, I’m head over heels for this recipe, it looks gorgeous! What a pretty dish! I love hash too! I’ve never tried it with salmon, but that’s going to change! My goodness. 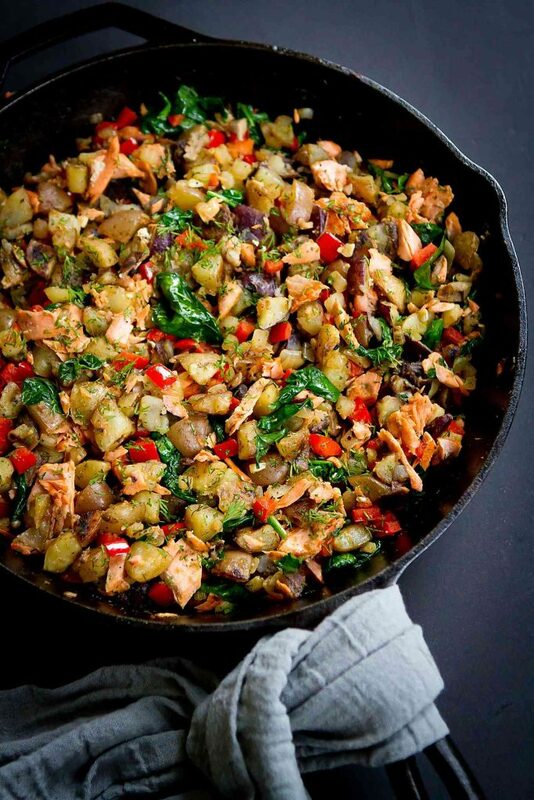 This potato hash just looks HEAVENLY, and I love that you added salmon to the mix! I could eat this for brunch, lunch OR dinner! 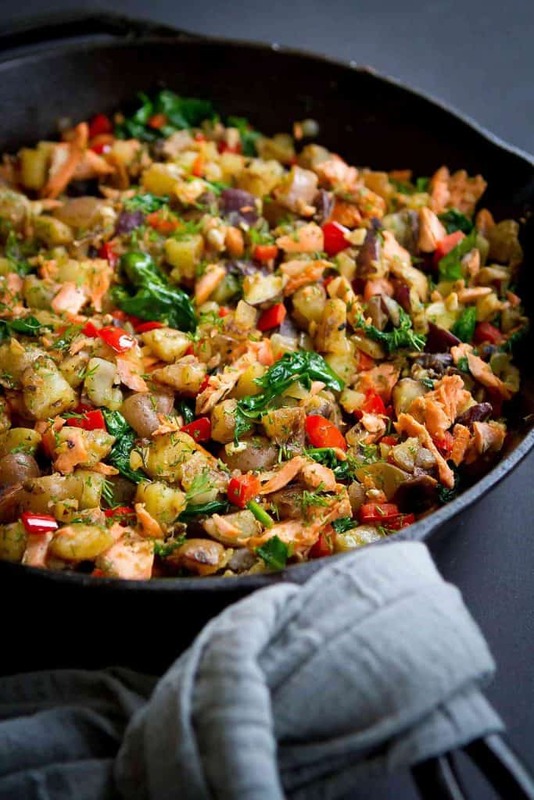 Absolutely love the addition of salmon in this hash, Dara! Wow, this hash is gorgeous! I can’t get enough potatoes in my life, so this is definitely on the list to try! Hash is my husbands absolute favorite for family breakfast on the weekends! This looks so good! !